Ragnheiður Elísabet is the woman behind the curtain. She works as an event manager for the art space Mengi, which hosts concerts and other art events as well as releasing music. She likes working behind the scenes and helping artists realize their ideas. 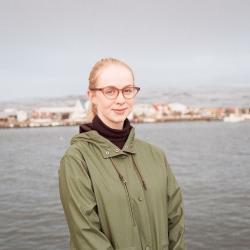 Along with the group behind Mengi—Elísabet Jónsdóttir, Bjarni G. Sigurðsson, Ólöf Arnalds, Skúli Sverrisson and Elísabet Indra—Ragnheiður has helped MEngi become one of Reykjavík’s most valuable cultural venues. We asked Ragnheiður to list her top five favourite Icelandic albums—here are her picks. Andi came into my life as an unexpected ray of sunshine after a long winter. Lady Boy Records released the album earlier this summer and it became quite successful. I am so thankful for Andri’s music: my cheek muscles were sore after listening to it because frankly, I couldn’t stop smiling. The melodies are spot-on and the beat is perfect. I’ve never heard anything quite like it—it’s so original! Thank you Andri for this album. I wholeheartedly recommend everyone listen to it, you won’t regret it. This album is a hidden treasure of Icelandic music. Mengi released a limited pressing of it in 2014. It features seven original pieces by Orri Jónsson and Ingibjörg Birgisdóttir and listening to it puts you in a sort of trance. I can listen to it again and again without ever getting sick of it. Yungchen’s voice, Anthony’s organ playing and Skúli’s bass lines create a perfect whole. I’m simply in love with this album and feel it deserves more attention. I like playing with the speed of it when playing it on vinyl because it also works when you slow it down. Kælan Mikla give their all in this début album. These girls are the best and I’m a total groupie. I love seeing their shows, their sound is tight, they’re rhythmic and so tough. I usually run right up to the front and dance as if no one’s watching. Their album is something everybody should own. GusGus and Trabant were two of my favourite bands a few years ago and whether I’m on a roll at the office working on something or travelling around the country, this album keeps me going. I love feeling nostalgic, which is why I chose this album rather than ‘Arabian Horse’ even though I find it just as good. Megas is the master and he never fails to please. His lyrics are genius and I love listening to him while driving around Iceland, especially in the West. This album is a treasure and was such a big part of my childhood.